The Sullivan family played an important role in the development of the lime burning industry on the Peninsula. Dennis Sullivan came to Portsea from Melbourne in 1843. He held a grazing licence covering four square miles of Portsea to Point Nepean. By 1845 he had built a limestone cottage, which now stands in the Quarantine Station area of Point Nepean National Park, and by 1852 he had built a lime kiln in the cliff nearby. Sullivan lost the lease to part of his land in 1852 when the government wanted the land for the new Quarantine Station. Dennis' son Patrick worked at several kilns before establishing this kiln in c1855, following the removal of the family from the Quarantine Station area. Patrick Sullivan acquired the freehold to land around the kiln in 1867. His family lived in a house nearby, but moved in 1876 to Cliff House, on the east corner of Napier Street and the Nepean Highway. The family, which owned a number of businesses in Rye, was also an extensive landowner. Sullivan's kiln was operated for about 60 years in the ownership of the Sullivan family, outlasting many contemporary kiln structures. Patrick's son James burned the last load of lime at Sullivan's Kiln in 1917. 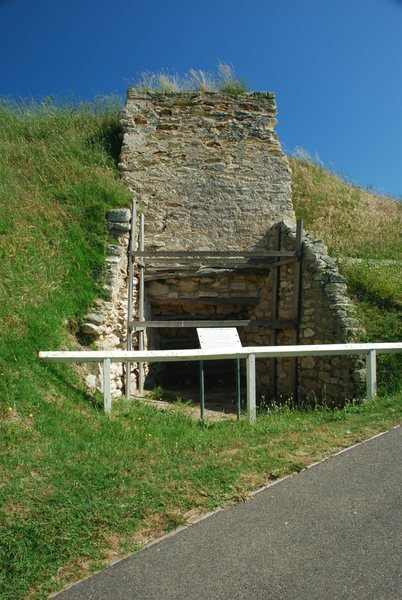 The kiln, located in the grounds of a golf course, is relatively intact and incorporates the general features of a hillside kiln. The cylindrical shaft, approximately 7 metres deep, is lined with Hancock brand firebricks. The front and wing walls are constructed of limestone blocks. A series of bush poles corbel out to support the limestone block roof. This gave access to the draw hole, which is now no longer visible, buried beneath the raised ground level surface. The top of the brick shaft stands 0.5 metres above ground level, similar to Duffy's Kiln at Portsea. The pitched roof, which would have spanned the retaining walls, has not survived. This is probably an example of a continuous feed kiln. Sullivan's lime kiln is of technological, historical and archaeological significance to the State of Victoria. Sullivan's lime kiln is technologically significant as evidence of the most important nineteenth century industry on the Peninsula. Lime produced in this area was used in the building trade in Melbourne and was of sufficient quality to compete with imports. Sullivan's lime kiln is historically significant as evidence of the nineteenth century denudation of the Peninsula landscape. In the 1830s she-oaks and banksias dominated the landscape of this area. However these trees proved highly suitable as lime burning fuel, as she-oaks in particular were a reliable, high burning fuel. Denudation of these trees was followed by the growth of the characteristic scrubby undergrowth and tea-trees evident on the Peninsula today. Sullivan's lime kiln is historically significant as evidence of the industry that anticipated later settlement. Patterns of settlement closely followed the location of kilns, for example at Portsea, Sorrento and Rye. The regular trade of lime schooners transporting lime to Melbourne enhanced communications to these relatively remote parts of Victoria. 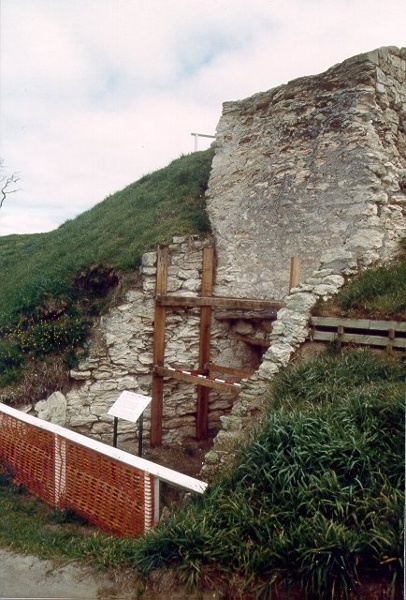 Sullivan's lime kiln is archaeologically significant for its potential to reveal buried deposits or artefacts associated with the lime kiln and the people who operated it. 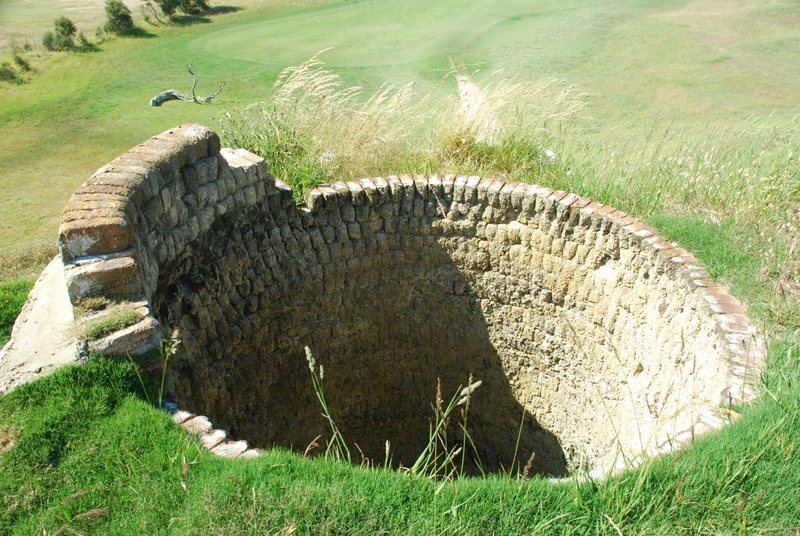 Sullivans Lime Kiln, The Dunes Golf Links, Browns Road, Rye, Mornington Peninsula Shire Council. 1 All the structure marked as follows on Diagram 1930 held by the Executive Director. 2. 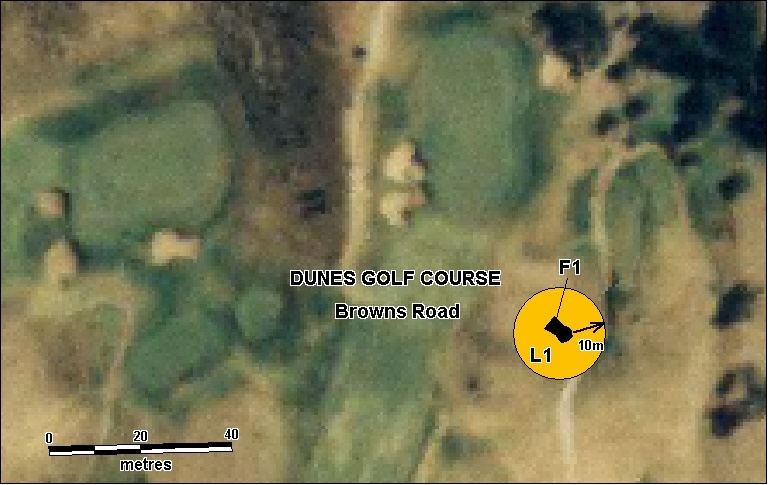 All the land marked L1 shown on Diagram 1930 held by the Executive Director, being the land described within a 10 metre radius circle taken from the centre of the brick shaft. Land Department files for applications for lime burning licences in the parish of Nepean show that the issue of licences was conditional upon an inspection by the Crown Land Ranger. The Ranger checked the boundaries to ensure that any new lime station was an appropriate distance from earlier stations. In 1855 two well-known lime burners, Sullivan and Ford, applied to purchase the freehold of their lime burning sites on which they had already erected homesteads. The request seems to have been refused on the grounds that every lime burner in the area would apply on a similar basis for their own freehold (Context Pty Ltd, Lime Kiln, 7 Merrylands Avenue, Portsea. Report on Conservation Works, p 2). The limestone resource on the Mornington Peninsula was utilised as early as the Collins’ Settlement of 1803. The remains of limestone chimneys and a powder magazine built by the Collins party was still evident in 1835 when John Pascoe Fawkner returned to the site. The first lime burners following settlement of Port Phillip were reputedly two men by the names of Kenyon and Rowley. They set up bush kilns in the late 1830s. The first recorded permit was to a Mr Berry in 1839. In the 1840s limeburning became the principle Peninsula industry, ahead of grazing, cropping and fishing. Settlements closely followed the location of the lime kilns. Due to the geology of the stone, limestone quarrying on the Peninsula was characterised by shallow lenses quite unlike the deep quarry pits in other areas such as Sale and Lilydale. Fuel for the kilns required massive amounts of timber, principally banksias and she-oaks. The demand rapidly denuded the landscape of trees, and in 1853 the government declared that firewood could only be gathered for limeburning purposes. The stripping of timber made an ecological impact on the Peninsula, changing it to a landscape dominated by scrubby undergrowth, principally of Coastal Tea-trees. In 1841 there were five recorded kilns on the Peninsula between Rye and Portsea. By 1845 there were seventeen kilns at the Heads. A flotilla of schooners transported the bagged lime up to the Yarra wharves, making the return trip in about two weeks, returning with coke fuel for the kilns plus building materials. In 1849 the fleet comprised twenty-five vessels, served by a purpose built dock on the Yarra wharves. In the 1860s there were more than forty vessels involved in the trade. Jetties on the Peninsula were constructed at Portsea in 1860 (by Ford), at Rye in 1860 (by Campbell) and Sorrento in 1874. The large fleet provided an effective and reliable means of communication between the Peninsula and Melbourne. In 1852 six leases were withdrawn on land chosen for the new Port Nepean Quarantine Station. These leases were held by Daniel Sullivan, Robert White, William Devine, James Ford and H G Cameron. William Cannon was also forced to move to the boundary line of the new station. By the mid-1850s limeburning activity was focussed at Rye. Larger commercial kilns were owned by local pastoralists such as Ford, Cain and Cairns and Melbourne lime merchants including Devine, Cameron, Wischer and Blair. At least twenty kilns were located in the Rye area in 1857. By 1891 there were just six. The industry was badly effected by limeburning at Lara, Geelong and later Walkerville. Limeburning on the Peninsula petered out just after the First World War. In 2000, only twelve kilns, plus the archaeological remains of the Roman cement works at Fossil Beach, survive as evidence of the lime burning industry on the Mornington Peninsula. Dennis’ son Patrick worked at several kilns before establishing his own, now located on the Dunes Golf links. This kiln dates from c1855, after removal of the family from the Quarantine Station area, and there were several huts as well by at least 1860. Patrick Sullivan acquired freehold to the land containing the kiln in 1867. His family lived in a house nearby, and moved in 1876 to Cliff House, on the east corner of Napier Street and the Nepean Highway. The family, which owned a number of businesses in Rye, was an extensive landowner. Sullivan’s kiln was operated for about 60 years in the ownership of one family, outlasting many contemporary kiln structures. Patrick’s son James burned the last load of lime at Sullivan’s Kiln in 1917. * Repair, maintenance (or replacement by a similar structure) of the safety fence located behind the kiln shaft. The kiln is recorded on the State’s Heritage Inventory (H7821-0003) as an archaeological site. In 2000 a permit was issued for restoration and part rebuilding of the kiln, particularly the left wing wall. This work is still pending. It is important that works that may impact on the structure, or potential below ground archaeological deposits, are subject to the permit process. Repairs to mortar should only be conducted after consultation with Heritage Victoria. Previous use of particularly hard cement to repair mortar will have a detrimental affect to the limestone blocks, and will accelerate their destruction.